Question: How do you get someone who loves pizza and wants to eat it at every meal to eat a healthy version of pizza that you can make in 15 minutes? 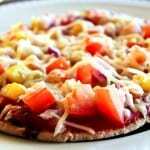 Answer: Make whole wheat pita pizzas! 1 cup freshly grated parmesan cheese you can use up to 1/4 cup per pizza, no more than that! Top 1 pita bread with 1-2 Tbsp sauce, and a handful of each of the veggies (use as much as you like – the more veggies, the more fiber and nutrients are on your pizza!) I like to use a ton of veggies. Heat the pizzas in a toaster oven until the cheese melts. Alternatively, if you don’t have a toaster oven, you can heat the pizzas under a broiler at 350 degrees until the cheese melts (or in your regular oven at 350 degrees).